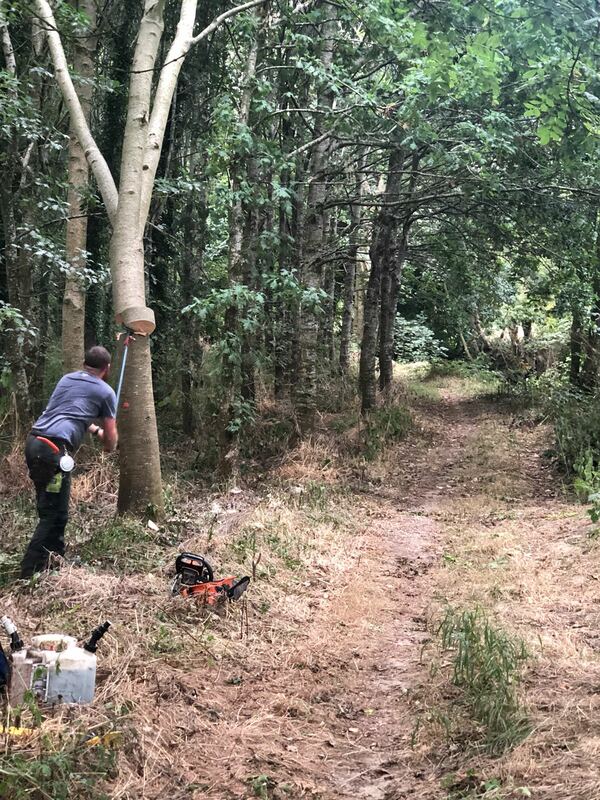 As a result of the recent activity of tree-felling in Belleek recently, I have noticed a conversation opening up on all the Social Media channels and print news regarding this hidden and, often misunderstood, occupation of the Tree Surgeon. To the untrained eye, the act of Tree Felling seems almost brutal. A vicious exerciser in destruction, rather than conservation. However, good forestry management requires some tough love and I myself gained first-hand knowledge on the subject some weeks ago while on a quiet stroll through some woodland near my house. It all started with a kiss. The kiss, that is, of the blade of a chainsaw against some wayward saplings which decided to plant themselves in the path of what will soon be a “Forest Freeway” The sound of the saw echo’s around the mixed forest near my home, and I stroll up the road to take a look. The plantation has been here a while, tall, footed ash waving slowly in the west wind, slowly and surely reaching for the skies. Oak spreading like giant hands silhouetted against the evening sky. There is a wide path through the woodland, and as I go deeper into the forest, the saw gets louder until I happen upon a lone woodsman, bedecked in armour-like personal protective equipment, arms held aloft as his saw eats through the trunk of a tall ash like a hot knife through butter. Strangely, I notice that he is making his first cut quite high up on the tree and then, using a system of crowbars, he levers the upper part of the tree away from the cut as it comes crashing down alongside the path. At this point, he notices me, switches off the chainsaw and walks towards me. The man is Robert Kirwan, forester, conservationist and tree surgeon. He also happens to be my first cousin. 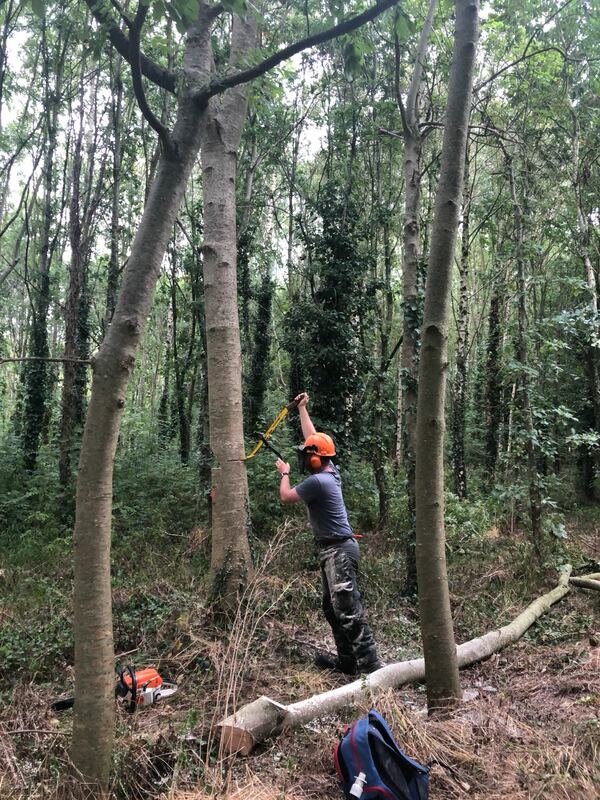 Our mutual interest in forest management has resulted in him doing some thinning work at my neighbouring woodland and, today, Robert is felling a particular type of Ash, or Fraxinus, for a very special order indeed. This explains why he is making the initial cuts so high up the tree in order to preserve the best parts of the tree for shaping the hurley sticks. The wood we stand in is of a Broadleaf mix. No conifers in here, no sir. “It drives me mad when I think of the type of forestry planting which was undertaken in this country years ago.”, Robert says, shaking his head. “Thousands of acres of coniferous planting and blanket clear-felling has left huge swaths of land without life and will take decades to regenerate”. He specialises in Broadleaf forest management and it is hoped that this is the type of planting which will be encouraged in the years ahead. These forests are grown and managed for around 16 years before they ever see a chainsaw and it is at this point that the 1st thinnings will take place. This is the stage that Robert is at in this particular forest and, as he has demonstrates, even the thinnings are commercially viable. “These butts are heading to Waterford and Kilkenny”, Robert explains with a grin. “I’d better cut them right or a potential All-Ireland might be in jeopardy!”. In a nutshell, for any readers who may be thinking of planting some of your acreage with forestry, it will probably be the most worthwhile use of your spare land. Depending on your situation, you could be eligible for a premium of €800 per year for around 16 years. Then, when the premium runs out, you will be able to apply for a Woodland Improvement Grant, which will go towards the 1st and 2nd thinnings. However, time is against you, for the bare-root season is upon us and will end at the end of March. This is the season when you can purchase the plants for your woodland at a considerably lower price than potted plants, plus they have a better chance of establishing. Mistakes have been made down the years, though and one such example was the planting of lines of Oak trees and Larch side by side. The idea was that the larch would outgrow the Oak, forcing them to grow straight in an effort to find light. However, through bad management, the Larch was never removed after the required number of years, thus finally smothering the Oak trees. “Forestry is the Long Game”, explains Robert. “You must be patient. Nature rushes for no man, but if we plant carefully and always keep in mind the legacy we leave for our future generations and the flora and fauna which will benefit from our plantations, the whole environment will thrive. As a Country, and in comparison to Forestry Planting in the rest of Europe, Ireland has a lot of catching-up to do”. With that, he turns on his heel and disappears through the wood, head always turned upward, gauging the trees with an expert eye. I am reminded of a quote I once read from Thomas Fuller, written in the 1600’s: “He who plants trees loves others besides himself”.